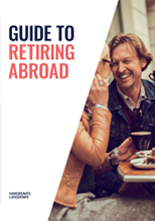 This quick and easy-to-read report highlights the factors everyone should consider when retiring overseas. This quick and easy-to-read report highlights the factors everyone should consider when retiring overseas. Please note this report isn't personal advice. The outlook and forecasts are the views of the participants, not Hargreaves Lansdown. They are information only and should not be read as personal advice. It is also not a recommendation to buy or sell any of the currencies mentioned. Past performance is not a guide to the future. Many British citizens swap the UK for their dream location abroad every year. But if you don’t do your research you could be faced with high exchange rate costs, unnecessary tax charges and expensive healthcare fees. This guide is for reference only and does not constitute personal advice. If you are unsure of the suitability of any course of action for your circumstances seek personal advice.